The building that would become Sofitel Munich Bayerpost was first constructed between 1896 and 1900 as the Royal Bavarian Post Office. The post office functioned as the most important distribution center for mail throughout the Kingdom of Bavaria. But from 2002 to 2004, local architects Fred Angerer and Gerald Hadler redeveloped the location for Sofitel, transforming the building into one of Munich’s premier luxury hotels. Angerer and Hadler opened up the existing floor plan, adding a blend of avant-garde architecture that made the building one of the most impressive structures in the entire city. Set in the heart of Munich, the hotel’s luxury guestrooms, restaurants, and meeting venues welcome all who stay. Whether for business or leisure, this five-star hotel offers a unique blend of contemporary style, comfort, and personalized service for each guest. Spa facilities at the Munich Bayerpost include an indoor swimming pool and a modern fitness studio. Sofitel Munich Bayerpost is located in the center of the city, which is perfect for guests interested in experiencing the history of Munich. The hotel is very close many popular attractions, including the Karlsplatz/Stachus shopping center and the Marienplatz Town Hall Square. There is also direct subway service to the Munich Airport, while the Munich Main Station is just a short walk from the hotel. 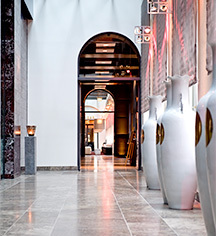 Sofitel Munich Bayerpost is the ideal place to stay for any adventurous traveler. 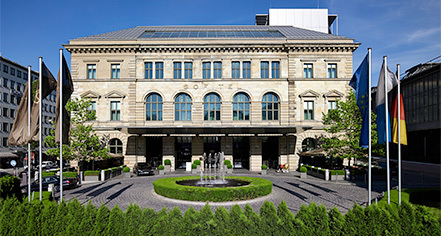 Sofitel Munich Bayerpost, a member of Historic Hotels Worldwide since 2018, dates back to 1896. The building housed the Royal Bavarian Post Office until 1993. Airport Transportation: Available, up 85€ each way. Cancellation Policy: Cancellation and prepayment policies vary according to rate type. Deposit: The hotel has the right to temporarily hold an amount prior to arrival. Early Check-In/Late Check-Out: Depending upon availability, charges may apply. Extra Person Fees: Any type of extra bed or crib is upon request and needs to be confirmed by management. Charges may apply. Hotel/Resort Fees & Taxes: Taxes are included. Parking: Indoor parking available for €37 per day. Payment: Visa, MasterCard, Amex, Maestro, Girocard are accepted. Pet Policy: Pets are allowed. Charges may apply. Rollaways: Upon request and needs to be confirmed by management. The building that would become Sofitel Munich Bayerpost was first constructed between 1896 and 1900 as the Royal Bavarian Post Office. The post office functioned as the most important distribution center for mail throughout the Kingdom of Bavaria. Learn more about the History of Sofitel Munich Bayerpost .